The Strong-Drive SDWC Truss screw provides a stud-to-bottom plate or stud-to-top plate connection as well as fastening trusses and rafters to top plates. The full-threaded shank engages the entire length of the fastener, providing a secure connection. The SDWC is tested in accordance with ICC-ES AC233 (screw) and AC13 (wall assembly and roof-to-wall assembly) for uplift and lateral loads between wall plates and vertical wall framing and between the top plate and the roof rafters or trusses. It is code listed under IAPMO-UES ER-262 and meets 2012 and 2015 IRC® and IBC® code requirements for several common framing applications. A sales flier explaining continuous load path implementations and the Strong-Drive SDWF Floor-To-Floor and SDWC Truss screws. A flier including features and benefits of the Strong-Drive® SDWC Truss screw. A sales flier providing features and benefits of the Quik Stik Rafter & Truss Fastening System. A flier providing product information and installation instructions for the Quik Stik Rafter & Truss Fastening System and Strong-Drive SDWC Truss screws. An operator's manual providing installation instructions for overhead assemblies using the Quik Stik Rafter & Truss Fastening System. Allowable roof-to-wall single-screw connection loads for Simpson Strong-Tie® Strong-Drive® SDWC Truss screws fastening raised-heel/energy-heel trusses and trusses with no overhangs. This letter details approved installations of the Simpson Strong-Tie® Strong-Drive® SDWC Truss Screws with the Quik Stik™ fastening tool for rafter/truss-to-top plate connections. Allowable loads are shown at the wood load duration factor of CD = 1.0. Loads may be increased for load duration up to a CD = 1.6. Tabulated values must be multiplied by all applicable adjustment factors per the NDS. The main and side members shall be sawn lumber or structural composite lumber with a specific gravity or equivalent specific gravity 0.42 to 0.55. Zpara — Parallel to grain loading in the side member and perpendicular to grain loading in the main member. Zperp — Perpendicular to grain loading in the side member and perpendicular to grain loading in the main member, except for 2x (edge) where main member is loaded parallel to grain. The connection conditions of this table are for specific intended applications. 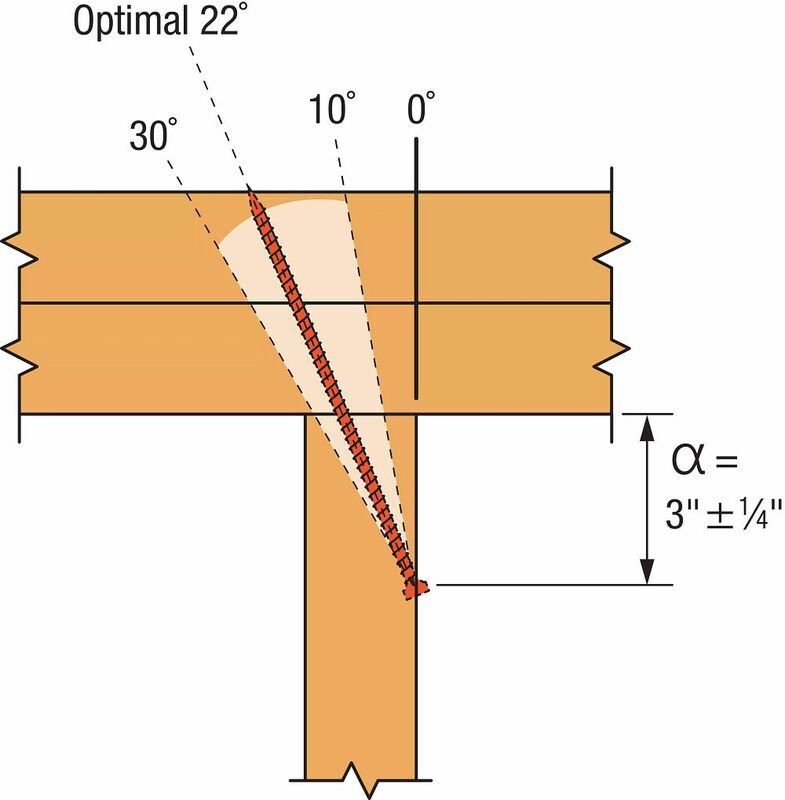 Reference lateral design values for all other shear connections are calculated following the NDS. The reference withdrawal and pull-through values are in pounds per inch of the thread penetration into the main member and a minimum 1 1/2" thick side member, respectively. Loads have been increased for wind and earthquake (CD=1.6); no further increases allowed. Reduce when other loads govern. Allowable loads are for an SDWC installed per the 'Recommended' or 'Optional' installation instructions. The SDWC is to be installed through a double 2x top plate into a minimum 2x4 truss or rafter. 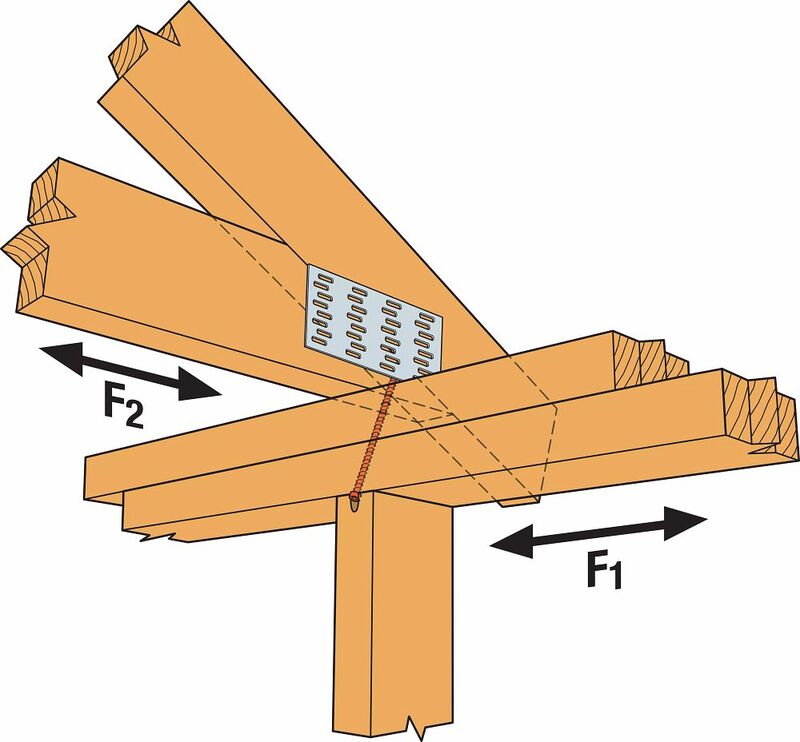 An SDWC screw may be used in each ply of 2- or 3-ply rafters or trusses. 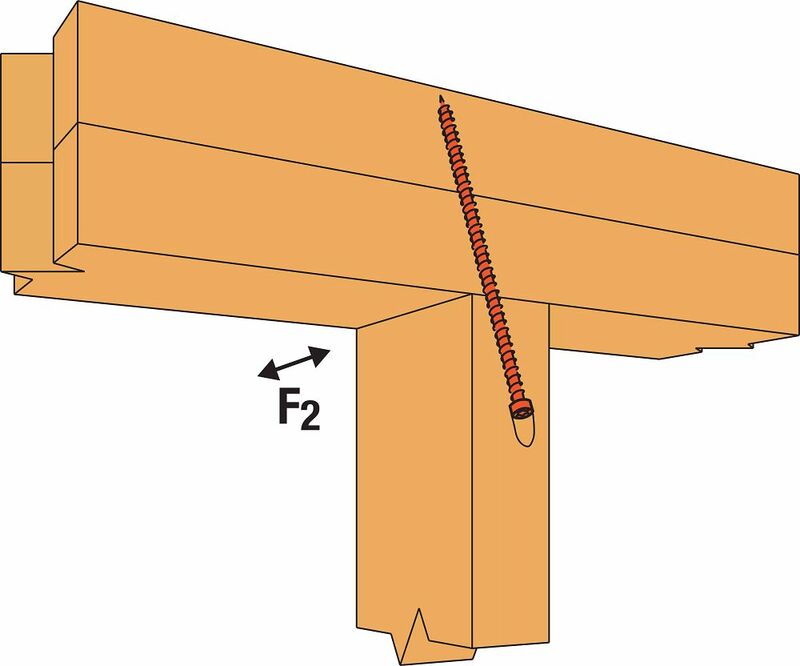 The allowable uplift load for each screw shall be multiplied by 0.90, but may be limited by the capacity of the plate or the connection between the top plate to the framing below. SDWC screws in multi-ply assemblies must be spaced a minimum of 1 1/2" o.c. Screws are shown installed on the interior side of the wall. Installations on the exterior side of the wall are acceptable when the rafter or truss overhangs the top plates a minimum of 3 1/2". For Uplift Connection Load Path, the designer shall verify complete continuity of the uplift load path. Table loads do not apply to trusses with end-grain bearing. Top plate, stud and top plate splice fastened per applicable Building Code. Allowable loads for the SDWC Truss screws when installed from the underside of the top plate and from the face of the truss/rafter using a two-screw configuration per the detail configuration shown. When cross-grain tension cannot be avoided, supplemental reinforcement shall be considered by the Designer. The SDWC screws shall not interfere with other fasteners or truss plates. Where truss plates must be penetrated for Configuration D, a Truss Designer approval is required in accordance with ANSI/TPI 1-2007 /2014, Section 7.5.3.4 and 8.9.2. To pre-drill through truss plate, use a 1/8" drill bit. The metal installation guide provided with the screw is angled at 22.5° and can be used for Configurations C and D; proper installation angles for all configurations are the responsibility of the installer. SDWC screws must be offset min. 1/4" from top plate splices for full values. Loads assume minimum overhang of 3 1/2"
Both screws installed at a 4°-14° angle, offset 3/4"-1 1/4" from opposite edges of the top plate. Allowable loads are for SDWC installed per the installation instructions. The SDWC15450 is to be installed through the face of 2x stud into a single 2x bottom plate over a concrete/masonry foundation. The SDWC15600 is to be installed through the face of 2x stud into a single 2 x bottom plate over a wood floor system. The SDWC15600 is to be installed through the face of 2x stud into a double 2x top or bottom plate. Double-top plates shall be fastened together as required by applicable code. The Strong-Drive SDWC Truss screw provides an easy-to-install, high-capacity solution for stud-to-bottom plate or stud-to-top plate(s) connections. This table provides additional allowable load information for the SDWC screws when installed through the narrow face of the stud. The allowable loads are for SDWC screws installed per the details shown installed per the details shown. The SDWC15600 is to be installed through the narrow face of 2x stud into a single 2x bottom plate over a wood floor system. The SDWC15450 is to be installed through the narrow face of 2x stud into a single 2x bottom plate over a concrete/masonry foundation. One SDWC screw per stud maximum when installed in the narrow face of the stud. Where the SDWC screws are installed on multiple adjacent studs, the minimum spacing between screws must be 1 1/2". The allowable uplift load for each screw shall be multiplied by 0.90, but may be limited by the capacity of the plate. For Uplift Continuous Load Path, connections in the same area (i.e. truss to plate connector and plate to stud connector) must be on the same side of the wall. Minimum spacing of the SDWC is 6" o.c., minimum end distance is 6", and minimum edge distance is 5/8".